As you may have heard, our nation had some elections on November 2th. And they resulted in dramatic changes in Congress. There&apos;s been a lot of talk about what this will mean for bicycling. It&apos;s too early to know for sure, but we know what we are going to do. We are going to get back to basics as we work with the 112th Congress and support local advocacy. It&apos;s not going to be easy, but it has never been easy before, and as cyclists, we know that what is easiest is not necessarily what is best in the long run. At the national level, the League of American Bicyclists is working with our partners in the America Bikes Coalition to build new relationships in Congress and strengthen old ones. We are honing our message to explain the importance of bicycling to help meet our nation&apos;s goals, such as economic development, health, the environment, and transportation. We will be looking for partners in the 112th Congress to champion these benefits. 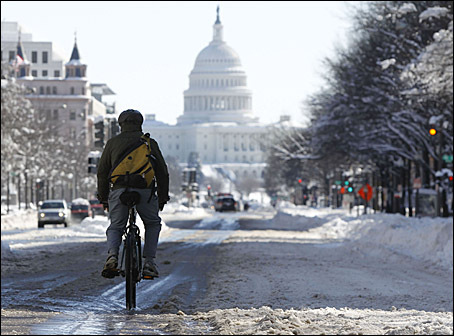 One of the first opportunities will be the 11th annual National Bike Summit in March. Eight hundred bicycling advocates from across the country will meet with their members of Congress to educate them on the issue, introduce them to important legislation, and find ways to work together in the future. We look forward to new members from both parties joining the Congressional Bike Caucus. Bicycling is for everyone; it is not a partisan issue. What&apos;s better than bi-partisanship? Bike-partisanship. We are also focusing on state and local advocacy. Advocates need to be prepared to look for funding from the sources that have traditionally been used to fund bike projects and to make the case for other sources from which funds are available. With our friends at the Alliance for Biking & Walking, we are training advocates on how to access federal funding for bicycling and walking projects to complete Bicycle Master Plans, fund Complete Streets, improve safety, and meet other goals. Investments in bicycling are cost effective and facilitate low-cost transportation, and they deserve their fair share, especially in a time of budget cuts and fiscal restraint. Therefore, we will also help advocates respond to threats to bicycling and pedestrian funding. Federal investments in biking and walking have steadily increased, as have biking levels. Bicycle projects and programs have been met with enthusiasm and support across the country and across party lines. With our coordinated effort, we will make sure that Members of Congress know how important biking and walking investments are to their constituents, so that they won&apos;t abandon this progress. The changes in Congress are real and come with a degree of uncertainty as to what to expect. But they are also a good opportunity to get re-energized, make some new friends, and prepare to defend our recent gains. Bicycling advocates have learned a lot since the first National Bike Summit in 2000. With this return to the fundamentals of organizing, the bicycling movement will become stronger and savvier still. Good stuff, Mr. F. Especially when read aloud in the bombastic style of Otter in the disciplinary hearing scene from “Animal House”. That is one damn good looking guest blogger.